KALA Kuwait handed over the first installment of Rs.10 lakhs to Chief Minister’s Distress Relief Fund. 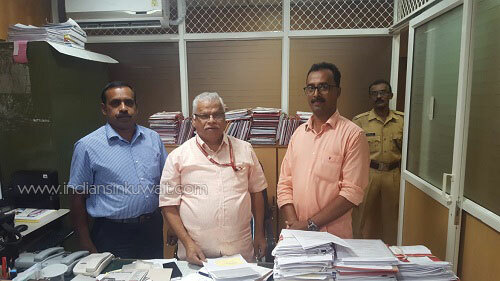 In the absence of the chief minister, Kala Central Committee member Mr. J. Saji and Kala Trust member Mr. Roy Nelson handed over the amount to the private secretary of the Chief minister Mr. M.V. Jayarajan. Now Kerala is facing unprecedented natural calamities- flood, landslide and heavy rain. All the districts are affected. The calamity has already claimed the lives of more than 200 people in a short period and the total loss till date is estimated to be more than Rs. 20,000 crores. Lakhs of people have been rescued and shifted to the relief camps. To support the victims of this disaster, Kala Kuwait has launched a door to door campaign for fund collection to the Chief Minister’s Distress Relief Fund. KALA has cancelled all its celebrations including onam and independence day celebrations and its members are actively focused in the charity campaign through house visits and other means. The Indian community is showing a positive approach to the fund collection program.